23 Digital supplied a responsive Magento eCommerce website with an effective digital marketing strategy to drive traffic and sales. Plus Size Bras was founded in 2007 as a husband and wife team. Since then, they’ve grown to become one of the country’s leading online plus size retailers. With a focus on providing fun, feminine and fashionable plus size clothing, the company is passionate about producing lingerie and other items that are comfortable, affordable and practical. 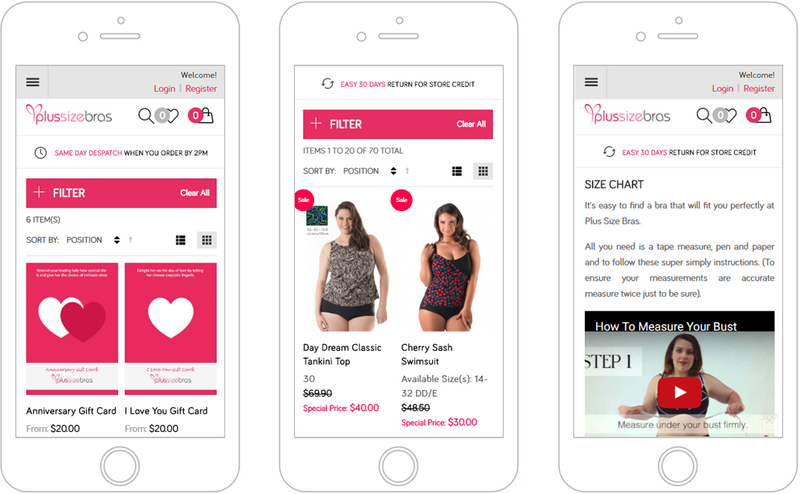 23 Digital provided Plus Size Bras with a responsive Magento eCommerce website, with features including suggestive search, eBay and Amazon integration, and an integrated bank payment gateway to simplify the checkout process and increase security. eParcel integration was also implemented for a streamlined shipping process, while a digital marketing strategy was provided to increase traffic. The outcome is simplified product management for Plus Size Bras and a higher volume of traffic and sales.